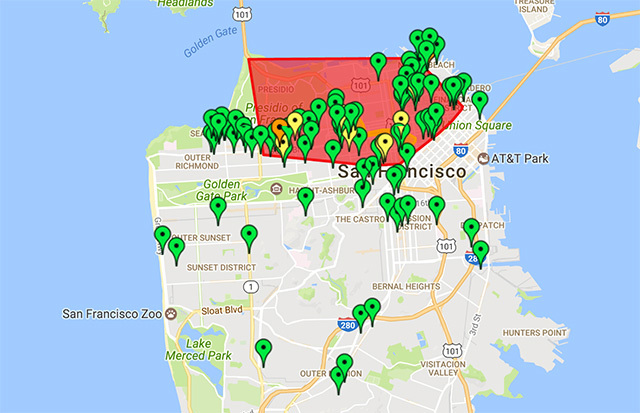 PG&E's supposedly real-time outage map, on their website, was nearly blank for San Francisco well over an hour into this morning's mass power outage  with the exception of a single reported outage in the Outer Sunset, as seen above  causing many to question why the utility would bother providing this tool at all. SFGate seized on the gaffe, and the outage map page now says across the top, "We are currently experiencing intermitent delays in updating the outage map. PG&E is aware of the large San Francisco power outage. We are currently working to resolve these issues." The map itself is supposed to be updated every 15 minutes. #SF Outage: 10k customers restored. Crews working safely & quickly as possible to restore more. Thank you for your patience. Most concerning was that a substation on Larkin Street appeared to be on fire, and PG&E confirmed that there was a fire there around 9 a.m. this morning, as the Chronicle reports, however a spokesperson said "it was not yet clear whether the blaze was a cause of the blackout or the result of it." The fire was reportedly under control as of 10:50 a.m.
You may recall that this same substation got knocked out during the December 2014 Rainpocalypse  a storm which now seems like child's play in comparison to a few we had this winter  killing the lights for roughly the same northern swath of town. The SFMTA touts its greener efforts. [Moving SF] UC Davis dorm gets vending machine that carries Plan B. [KRON 4] SF's fastest growing jobs that pay at least $70K are all in tech.